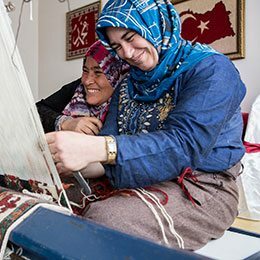 Woven Legends + Anka Coop to Train 20,000 Syrian Refugee Weavers by 2020!! The Anka Cooperative is currently working with 250 Syrian refugee women by teaching them the craft of rug weaving and employing them to rise again from the ashes of their past lives. Our goal is to expand this opportunity to 20,000 vulnerable refugees by 2020 by leveraging the proceeds from the sale of our rugs, and by partnering with leading refugee charities. The cinders of Anka ignited in 2012 when our CoFounder Neslihan approached the refugee camp management in Adiyaman, Turkey with an idea to employ and empower refugees by training them to craft high-quality, handwoven rugs. CoFounder Josh joined in 2015 to help scale the operation and to spread the word of this sustainable and worthy cause. 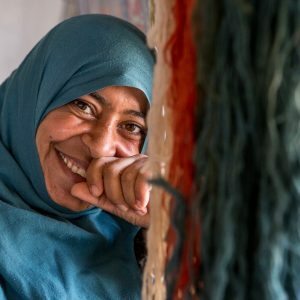 The Anka Cooperative is an initiative of Woven Legends which has helped to employ and empower tens of thousands of women in the Middle East for over 35 years. This phoenix is rising, but we need your help to take the Anka Cooperative to even further heights. Neriman from Damascus, is in her early 40s and has six children. Unlike many of her unfortunate relatives, she made it safely to the Adiyaman refugee camp in Southeastern Turkey. Neriman is college educated, and prior to the war she worked for many years as an accountant. But in the camps, there are no accounting jobs or freelancer websites to apply her trade. Idle time brings painful memories. She jumped at the chance to work at the carpet workshop. It’s a new skill, but she is learning – and just as important, she is earning a fair wage, same as her Turkish counterparts. She is saving to buy gold earrings for her daughters and hopes to save for a home for when they return to Syria. Her smile shines despite the tragedy she has faced, and she is very grateful to have the chance to work again. Turkey and over 10 million Syrian refugees are estimated to live around the world. These numbers are overwhelming governments and charities everywhere. The Anka Cooperative is just one small organization trying to do our part to give refugees hope and to provide them with dignifying work. Fatima and Hind both arrived in the Sanliurfa refugee camps almost in 2012. They consider themselves fortunate as they have a stable place to stay – for now. The war in Syria has taken an incredible toll on both of them. After a struggle of several months, Hind came to the camp from her hometown of Hama – a city which dates back to Biblical times. Fatima arrived from Edlib – this town was one of the first to rebel against the Assad regime. Since they began weaving in 2013 they have become the very best of friends. Both in their mid 30s, the ladies enjoy their work as they laugh and socialize. They represent the 250 Anka weavers that have chosen to make the best of their difficult circumstances. It’s an honor to have them on our team, as they are our reason Anka exists. Neslihan, is the CoFounder and volunteer CEO of The Anka Cooperative. 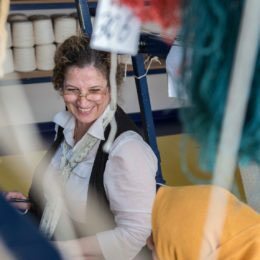 As the founder of Woven Legends, she has been producing high quality, hand-crafted carpets for over 35 years and has won numerous international awards for her carpets which are considered to be among the finest in the world. Neslihan has often been credited with birthing the rug renaissance in 1980’s by exclusive use of handspun wool and natural dyes. In 2012, she approached local officials in Turkey in order to teach weaving skills to Syrian refugee women at the camps. As an American and a native Turk, Neslihan feels a personal and moral obligation to support the Syrian refugees in Turkey. Through Anka, she has pioneered the idea of sustaining their livelihoods by promoting the art of carpet weaving. Her personal rapport with the refugees convinced her that Anka can expand from serving 250 refugee women to empowering 20,000 refugees by 2020. Neslihan graduated from Robert College in Istanbul, Turkey and has a B.S. in ceramic engineering from Alfred University, NY. In 2015 she received a Special Citation Award by American-Turkish Council in recognition of many years of supporting strong American-Turkish relations. Neslihan has one son, Kent, and considers the tens of thousands of women she has empowered over the decades as her many daughters. Josh is the CoFounder and volunteer Chief Strategy Officer of The Anka Cooperative. Having lived, worked and volunteered on four continents, Josh brings a global and practical approach to helping fulfill Anka’s mission – to provide dignity of work, transfer of skills and cultural integration through the creation of traditional crafts. 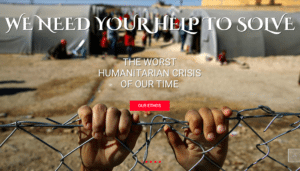 Deeply affected by the refugee crisis he saw while working in Turkey, Josh identified ways for US businesses to lend their expertise to help address this humanitarian dilemma. 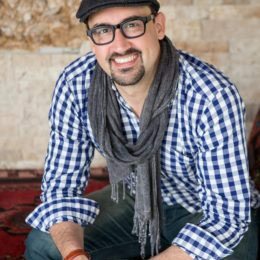 He previously worked in Strategy & Operations at leading managing consulting firms where he advised Fortune 100 companies on mission critical projects related to Operational Excellence, Process Improvement, and Market Strategy. Josh first experienced life overseas while serving as a Peace Corps Volunteer in Romania where he worked with local government and businesses on economic development issues. While earning his MBA at the University of Notre Dame, Josh studied finance and economics in Santiago, Chile. Josh holds Lean Six Sigma and Global Business Professional certifications, and a Mastering Trade Policy certificate from the Harvard Kennedy School. He speaks Romanian and Turkish and is proficient in Spanish. Josh and his wife Anca have been married for ten years and have two daughters, Alexandra Kennedy & Gabriela Francis.